Welcome to Midas Charity Appeals, the fundraising consultancy for charities and not for profit organisations working anywhere in the UK. Founded in 1977, we are a team of professional fundraisers who, between us, have a wide range of skills and a wealth of experience in delivering a combination of strategic advice and quality hands-on fundraising and management services. Each of our fundraisers bring specialist knowledge and expertise in a variety of fundraising skills, including raising funds from wealthy individuals, UK grant-making trusts, European foundations, the corporate sector, UK and EU statutory funders, the Big Lottery Fund, and many other sources of funding. Midas also offers a special Application Check Service which can make the difference between success or failure on important multi-year statutory or charitable trust applications, Mentoring which is a highly cost-effective way of developing your - and your organisations - capabilities, and a range of other essential services. 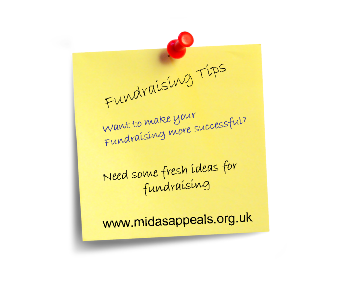 For more information on how we can help your organisation please click here and for more information on Midas fundraisers please click here.